Seldom such a run of reporters was to be seen after the defeat of a world champion like the official weighing of the Eliminator fight for the challenge right against the world champion David Geale, the winner on points had remained in the world championship fight one day before against Anthony Mundine. Thus it becomes, if Sturm will win against Soliman the from all desired rematch against Geale. Sturm lost the first fight at 9/1/2012 scarcely and unexpectedly after points and with it his WBA title (World Boxing association). Indeed, experts agree that Sturm must win this fight against Soliman under normal circumstances on account of his quickness. And when Felix entered the stage to the cradle under announcement of the ring speech legend Mikel Buffer, whispering went by the amount. Thus stripped one has never expected Felix. Every muscle came by in the toughened Sixpack body. Felix knows just what it depends on. He must win this fight. Because of TV contracts, because of sponsor's money, because of the future of his box stable. But also because of his own claim. He knows as well how good he is. The more one had been surprised how easy and confidently he was under this immense pressure. With winning the Stardedown the first victory against Soliman gained. This rest shows the mentality of a true champion. It is difficult just for outsiders to understand like it is if one celebrates himself also sometimes even a little. Sturm proudly presents his incredible belly musculature. After smalltalk with his trainer Fritz Sdunek, Fritz explained that Felix on the point ready for the fight. And even his physiotherapist promises an unequivocal victory and explains that Felix has no physical little complaints. Lets hope only that Soliman lands no Lucky Punch because Felix will be feel too certain or by his violent weight losses (he muste loose 12.5 kg of weight within 5 weeks ) in strength leaves. 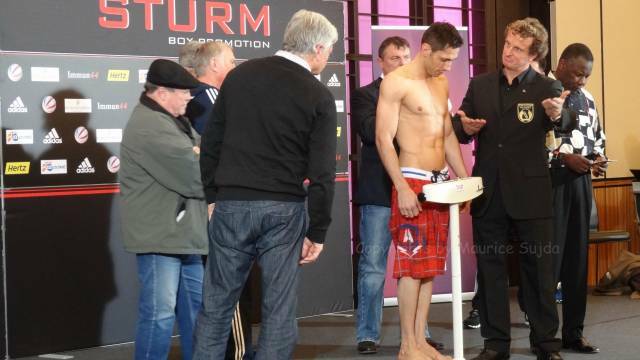 Since Felix Sturm in the preparation has to do nothing with Felix Sturm who entered the scales with precisely 72.4 kg (still 174 grammes under the limit). Even the opposing camp had been surprised and was asked by BDB president Thomas Pütz to control exactly. Who came one day to Felix Sturm Gym in Cologne will be shocked before this athletic "Hulk".Felix mostly resembles up to 6 weeks before his fight regularly rather a bodybuilder then to a professional boxer in the middleweight. The more the motto of this fight "hard way back"applies there then also. And if one is honest who else is then there in this weight class in Germany except Felix Sturm? Technically limited Arthur Abraham? Diligent however have no chance Sebastian Zbik? Technically almost nearly that great Robert Stieglitz but not that well known and promoted? Who has such polarised till this day than Felix Sturm? So everybody who is a fair sportsman and a real boxing fan wishes his victory at 2/1/2013. A lot of luck Felix, and give everything.